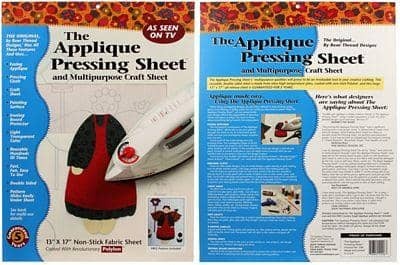 Double-sided & made from an ultra high temperature fabric that is coated with non-stick Polylon - the Appliqué Pressing Sheet is a valuable tool used in the art of fusible appliqué. Its versatility also lets you use it as a pressing cloth, ironing board protector and non-stick craft sheet. It also maintains the opaque color that allows quilters to place their pattern underneath for perfect applique placement. 13"x17". Instructions and a free pattern are included.